The engine of your car combines air and gasoline in the combustion chamber to generate energy for the vehicle. The air reaches the engine through the air filter, which prevents dirt and dust to ensure maximum engine power. At the same time, the air filter must allow air to reach the engine for optimum performance. However, over time, dirt and other contaminants clog the air filter, which affects the performance of the vehicle. We will help you understand some obvious signs of a dirty car air filter and how you can solve the problem. How can I replace a dirty car air filter? driving in crowded areas; then I would need to stop and start more often, which will affect the air filter more. Remember; Do not think that cleaning the air filter and the engine are the same. What are the symptoms of a bad air filter in a car? Many drivers often wonder what symptoms indicate having a weak and dirty car air filter in their vehicle. Below is the list of symptoms, which will help you make the right decision regarding the car's air filter. These symptoms not only occur due to a weak air filter, but may also indicate an underlying problem in the vehicle. The automobile engine always compensates for a lower amount of oxygen by consuming more fuel to produce enough energy to move the vehicle. However, if you notice that the fuel consumption decreases every day, it is time to change the air filter. It is mainly applied to cars with carburetors manufactured before 1980. Carburetors mix air and fuel to generate power for the internal combustion engine. You can browse online to learn the best maintenance tips for the car's air filter. One of the symptoms of the clogged air filter that causes the car to respond poorly with sudden movements when the accelerator is pressed reduces the power. It may indicate that the engine is not getting enough air for performance. Therefore, replacing the air filter would also help improve the air flow and power of the vehicle. The limited supply of air from a dirty air filter in the car will always result in unburned fuel leaving the engine as a soot residue. The residue will accumulate in the spark plug, which will not provide the spark needed to provide combustion to the air and the fuel mixture. You can quickly notice that the engine would not start, but it would shoot and jerk abruptly. It is one of the severe symptoms of the air filter, which affects the performance of the engine. 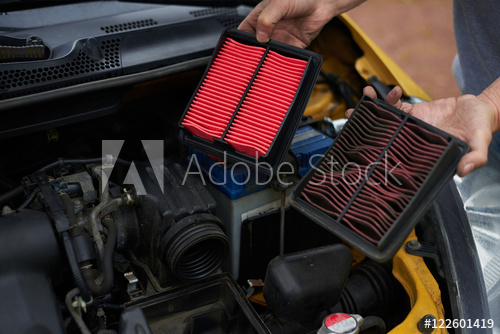 Therefore, when any of the above symptoms seems to occur when you try to start your vehicle, it is most likely the dirty car air filter, which needs an immediate replacement. If attended to immediate the problem will be solve with immediate effect.